Clinical Trial Conclusion. What I learned. 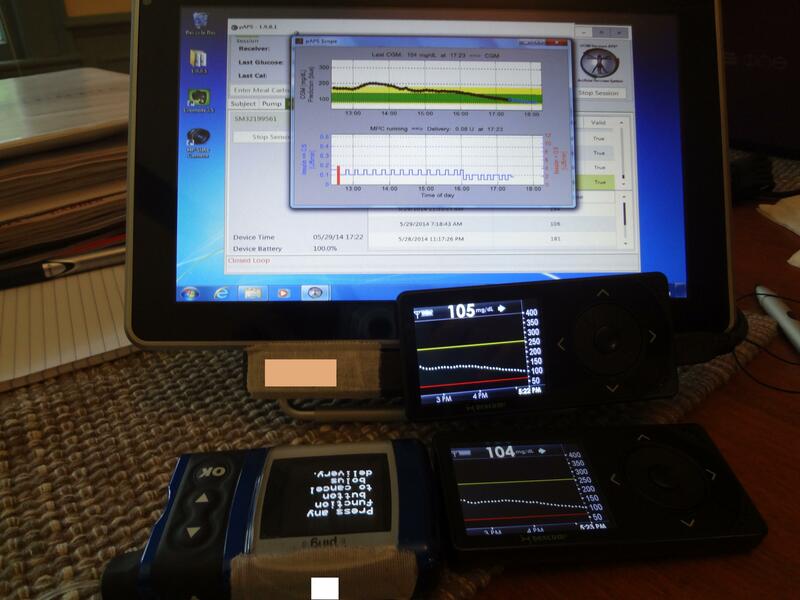 This is one in a series of posts detailing my participation in a clinical trial with an artificial pancreas element. I’m writing about this to chronicle my experience, and because if I were reading, I’d want to know about every aspect of what was going on. For more on this clinical trial, click here and here. Last week were the final two days of my clinical trial in Virginia. This week we went through everything we went through the previous week, and everything at the same time as last week. So if I ate breakfast at 7:00 a.m. the first week, breakfast the second week was at 7:00 a.m. And it was the same breakfast. Everything, food, exercise, the whole thing, exactly like the previous week. The real difference is that in the first week, the algorithm running my artificial pancreas system was based on the data collection week I had gone through earlier in the trial. The second week, the algorithm was based on my own pump settings. The idea was to compare the special (or experimental) algorithm with something based on what I work with every day. Note: I believe this explanation is different from what I had written before. Sorry about that. Sometimes I don’t get a complete, exact idea of what is transpiring until it transpires. I have no idea how everything turned out. Which algorithm worked better? I don’t know. And I don’t care. Because what worked best doesn’t matter. Gathering data is what matters in a trial like this. Like an A1c, the scientists working on this artificial pancreas solution need data to help them decide how to improve the device going forward. Good or bad? There is no bad data. 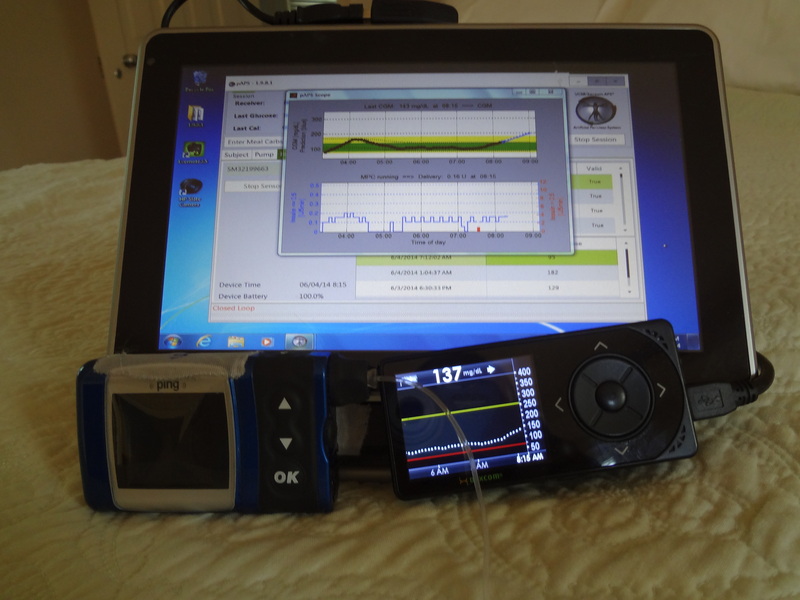 What was it like being hooked up to an artificial pancreas device twice in two weeks? It was… interesting. It wasn’t as “set it and forget it” as I had convinced myself it would be. And that’s one of the takeaways from this trial that really hit home for me. No matter how my external organ will perform for me in the future, I will still need to be an active participant in managing my diabetes. It’s just that an AP device would make things easier, in theory, while providing me extra protection from dangerous lows, particularly overnight. The other big takeaway for me has to do with how an AP system is designed to work. The idea of small micro-boluses every five minutes sounds great, until your glucose starts to get up into the 200 mg/dL range. When I see a number like that a few hours after a meal, I immediately want to perform a correction bolus. A full correction, to get my BG down to the 100 mg/dL target. So in my case, if my number was 220, I would bolus three units of insulin to bring me back down to 100. But an artificial pancreas doesn’t work that way. First of all, instead of trying to correct that number to exactly 100, maybe it would try to correct that number to a range instead. That might require a different amount of insulin. Also, my device was not going to administer all that insulin at once. It’s still going to give me small amounts, every five minutes, until I softly land in a good range (for this study, that was between 80 and 140). I think the largest amount I was given at any time (other than meals) was 0.25 units. When you look at your CGM graph on the artificial pancreas, you’ll see gentle rolling hills, instead of high mountains and deep valleys. I love the thought of that. But for me, not attacking a higher number immediately will take some getting used to. Really, it will require a completely different way of looking at my diabetes. So in the final analysis, scientists learned something from this clinical trial (I hope), and I think I learned a lot too. When an artificial pancreas device actually hits the market at some point, I’ll be viewing it through an entirely different lens. And that’s okay. Because the older I get, the more I realize that I’m not perfect, and opening myself up to different ways to manage my disease could possibly lead to something great in the future. Here once again is my push for clinical trial participation. Clinical trials meet a very necessary need when it comes to developing drugs, devices, and therapies that will help all People With Diabetes lead better lives. I strongly encourage you to think about volunteering for a clinical trial. The USA’s National Institutes of Health has a complete list of clinical trials taking place all over the USA, and even some outside of my country. To find them, go to www.clinicaltrials.gov and enter “diabetes” into the search box. A recent search found 11,175 studies. 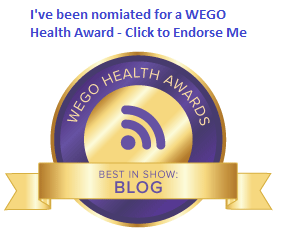 This is one in a series of posts detailing my participation in a clinical trial with an artificial pancreas element. I’m writing about this to chronicle my experience, and because if I were reading, I’d want to know about every aspect of what was going on. For more on this clinical trial, click here. Last week, we reached the first admission for the clinical trial I’m participating in. This trial includes time hooked up to an artificial pancreas system. The AP system and the algorithm running on it was designed at University of California Santa Barbara, and is being tested there as well as at University of Virginia and the Mayo Clinic in Minnesota. As much as I can, I’m going to give you the play-by-play of everything that occurred over 48 hours or so from May 27th through May 29th. The first thing I had to do was insert two Dexcom CGM sensors two days ahead of the admission. We needed to make sure there was enough time for the sensors to get calibrated, and for all of us to make sure things were working properly. There were two sensors because we needed one to work with the artificial pancreas system we were testing, and one as a backup, just in case. 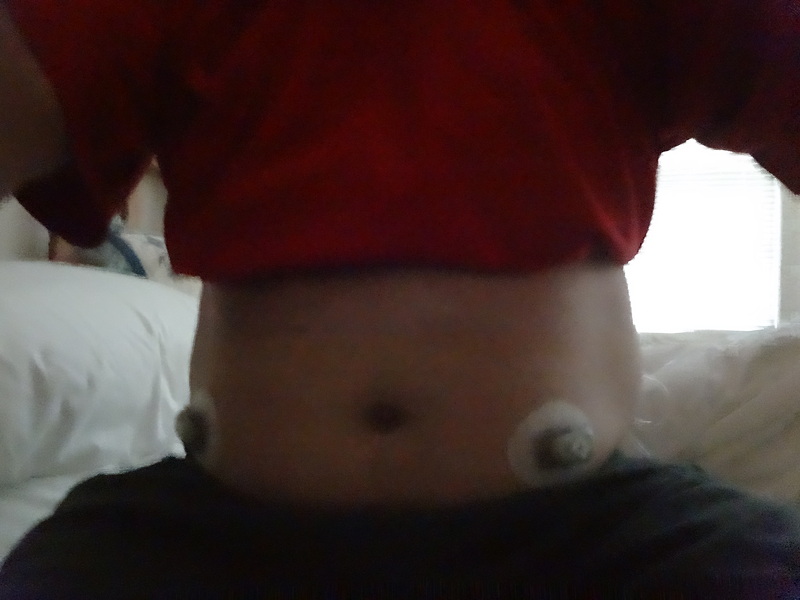 For the record, during the day and a half of closed loop testing, I had 2 Dexcom sensors and 2 infusion sets (one for the pump used in the trial, and one for my own) inserted around my midsection. Then I had to actually get there. That meant driving to Charlottesville Tuesday night, so I had time for my BG to calm down before the admission officially began on Wednesday around noon. I could have gone down on Wednesday morning, but the concern for me was that among the many guidelines (read: rules) in this study, I couldn’t be admitted if my BG was 250 mg/dL or over. My glucose level really spikes after I drive anything over two hours. Since Charlottesville is about four hours away, I went down on Tuesday night. This admission (and next week’s too) took place at the research house that the Center for Diabetes Technology has in Charlottesville. It’s close to the university and the hospital, but a lot less clinical, and that’s nice. Anyway, after a comfortable night’s sleep and breakfast the next morning, I gathered with the other participant in this trial and the staff working on the first part of this admission. We began with a BG check, then lunch. What a great way to start! About the meals: We could eat anything we wanted, including snacks, as long as they were under 90 grams of carbohydrates. The thing is, however: Anything we ate at last week’s admission (with the exception of potential hypo treatments), we have to eat during this week’s admission. Exactly. At the same time. After lunch, the teams started the process of getting us hooked up to the closed loop system. We had to bring our own insulin, and it’s used in an Animas Ping pump for this trial. Good for me, since I’m still thinking about a pump change, and I hadn’t used a Ping before. Once we were hooked up to the pump, and I disconnected my personal pump, we went into another room while more team members completed the rest of the steps to get the closed loop system started. There are a number of detailed steps in the process. So many that a written “sequence of events” is followed. – Since it’s a Ping pump, it included the meter remote that’s usually used in conjunction with the pump. 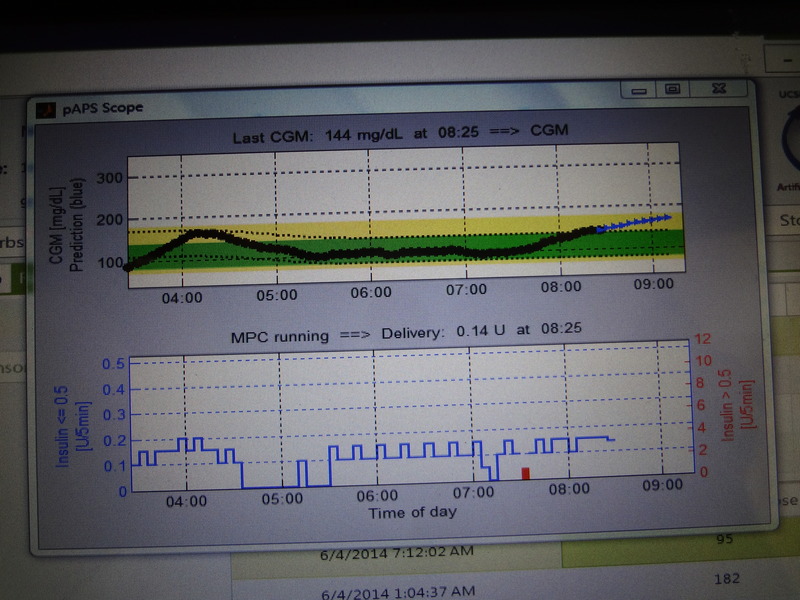 In this case, the meter remote was getting data directly from one of the Dexcom units, then sending the data to the AP algorithm loaded to the tablet. That algorithm was designed to take that data and use it to give micro boluses every five minutes during the trial. For this part of the trial, for me, something between .05 and .25 units at a time. Are you still with me? – A phone. The idea of this phone was to be able to receive messages when my BGs could possibly get dangerously out of range. Still, that’s a lot to carry around. Imagine having all of that with you, and having to have it in close proximity to you all the time. Including in the kitchen, in the shower,etc. I had a bit of exercise both days, and that meant someone on the team had to be with me with the tablet close enough to me to read the Dexcom and send insulin via remote. It was working right next to me while I participated in the Wednesday night DSMA Twitter chat. Here’s what one of the screens looked like. The top number is my BG readings from the Dexcom sensor (the black part of the line are actual readings, and the blue part is predicted readings), and the bottom graph is the amount of insulin being doled out every five minutes during the same time. The red vertical bar in the insulin graph marks my bolus from lunch. As you might imagine, there were regular fingerstick BG tests throughout the admission. And every 15 minutes, night and day, someone was coming by to check my tablet and write down specific data. Now, you might be thinking: Hey, this is crazy… Who, in real life, would put up with all of that? To which my answer is: This is a test of a system that is in development. It’s not the ready-to-take-home version of something you’ll be filing insurance paperwork for soon. At this point, I think they just want to see if what they’ve worked on so far is doing what they want. I also realized that something like this, which in theory eliminates basal rates, requires a complete change in thinking. I can’t quite put it into words yet. I spoke a little with the doctor in charge of this testing, and between us, we understand that comparing the management of my diabetes with an AP system versus what I’m doing now is like comparing apples to artichokes. I came away with a completely different way of looking at my diabetes, and a fresh set of questions about what we need from a fully integrated artificial pancreas system once it’s ready for approval from the FDA. More to come next week! Didn’t you mention something about a clinical trial? Yeah, so I started a new clinical trial almost two weeks ago. This one, like the others, is being conducted out of the Center for Diabetes Technology at the University of Virginia, and also at UC Santa Barbara and the Mayo Clinic in Minnesota. First, I went to Charlottesville to get screened for the study. This meant going through a physical, getting blood drawn for an A1c, having an EKG performed, the whole nine yards. We also went through the consent form (about 20 pages or so), and I submitted my medical history. This included things like confirming I was Type 1, that I’m not currently seeking treatment for things like alcohol or drug addiction, listing any hospital stays I’ve ever had, and listing out all of the medications I take on a daily basis, and in what amounts. The hardest part about these visits is that my BGs get so ramped up driving down to Charlottesville that I’m always running high when I arrive. The Jersey Turnpike has nothing on Interstate 81. After the screening visit, I drove back home (more stress—I don’t know if I made it below 200 mg/dL all day) and waited for the phone to ring, telling me whether I had been accepted or rejected from the study. I had been rejected from two previous AP trials (different reasons), so I wasn’t holding my breath over this one. But I was accepted, and I was thrilled. 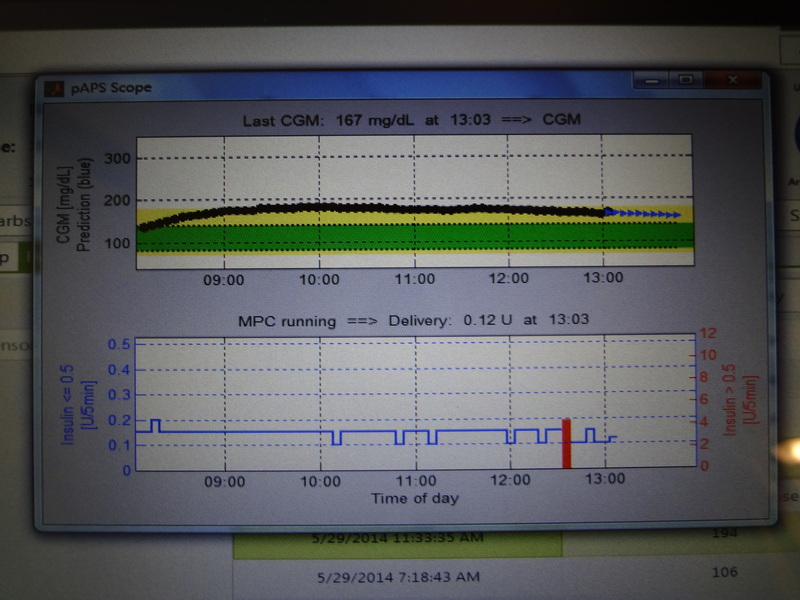 The following week I started a week of data collection by inserting a Dexcom sensor. I also started using a meter given to me to specifically be used for this trial. And I started keeping a daily diary. It included information on whether I was sick, whether I did a pump site or CGM sensor change, how I was feeling, how stressed I was about hyperglycemia and hypoglycemia, and whether I worked out that day. In addition, I needed to record times, BG fingerstick numbers, and carb counts of everything I put into my mouth. For an entire week. At the end of the week, I uploaded pump, CGM, and meter data, and faxed the daily diary info to the research team. What was the purpose of all this? So the team at UVA could use my data to help build an algorithm specifically for me. When we finally get to the point where I’m hooked up to the closed loop system, the algorithm will work to help anticipate BG trends and carb intake, and make updates to insulin delivery as a result. Cool, yes? So what’s next? Next are two separate admissions in the Center for Diabetes Technology’s research house in Charlottesville. I don’t know which visit will be which yet, but I do know that one of the visits will involve being on the closed loop artificial pancreas system itself, and one visit will not. The idea, as I understand it, is for the team to compare results on the closed loop system versus results from an open loop system in which I’m making decisions on my own, just like I do today. My first admission is next week. Wish me luck! Actually, no… wish the dedicated team of researchers, developers, doctors and nurses luck. They’re doing the hard work of creating something that could be a game changer in terms of insulin therapy for people living with diabetes. Remember this: In all of these studies conducted, there have been zero overnight lows. My hope is that I can help further research into this and other advancements that are making the lives of the newly diagnosed better than I ever could have imagined at my diagnosis back in 1991. You and I are worth the effort. I’ll try to give as much of a play-by-play account of what’s going on as I progress through the trial. Watch this space and Twitter for more.